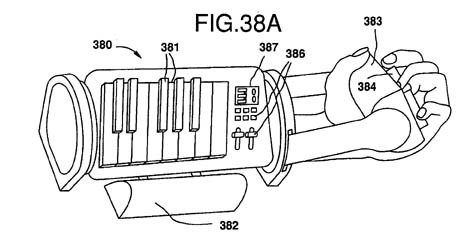 Here’s an excerpt from the original patent specification describing the wearable musical instrument (MIDI input device) that eventually became the Orang-Otang™ Jango™ keyboard. FIG. 38A depicts a Musical Key Palette. The Armpiece (380) of the depicted model bears an octave of standard-sized MIDI piano/keyboard keys (381), although miniature piano/keyboard keys are also contemplated. Jutting out from under these keys is a Sustain Bar (382), which a user holds down with his wrist while playing in order to sustain notes, just as a sustain pedal is used on a regular piano. A standard MIDI footswitch, breath controller or volume pedal can be plugged into standard ports on the Musical Key Palette as an alternative means of sustaining or of inputting other MIDI data. Also depicted is a Bass Guitar Handpiece (383), which includes four rows of keys, four keys per row, designed to mimic four frets of a four string bass guitar and to send a MIDI signal when a given “fret” is “hammered on.” Columns of keys are divided by removable Guiding Walls (384). Such a key configuration is typical, providing a user with sixteen pitches, but models with more keys for more dexterous users are contemplated. Supplementary input means for timbre selection, key selection/transposition, parameter editing and other typical MIDI functions are provided (386), as is a small digital monitor (387) which displays MIDI patch number and similar information. FIG. 38B displays a Musical Key Palette upon which a Joystick Simplified Handpiece (388) has been mounted. The x axis and y axis position of this Handpiece can be assigned to control MIDI signals for pitch bend, vibrato, stereo-panning, etc. The buttons on this Handpiece/Joystick can be used to control sustain, key transposition, and other MIDI functions. FIG. 38C demonstrates another type of Handpiece (389), one which is simply a second set of piano/keyboard keys set in a plane.